This month has gone by in a blur. voucher Stuart got me for my birthday last month. Mainly Blake and I have spent time going to our favorite group Ragdolly Anna's. We have also met up with another Mum and her little boy at the community house for lunch and a chat. are even planning to meet up tomorrow and go to the park. Sunday was an extra special day for us as it was Blake's Christening. I will do a post about his special day very soon. 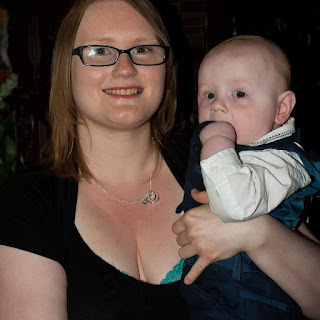 I of course had to choose one of his Christening photo's of us together. He looked so cute in his little suit and he seems to like it since he has his waistcoat in his mouth in this photo. I hope that August will be just as fun as this month.